A proud tradition of funding our Pack! Our Scouts did an outstanding job. Pack 62 held the Longs Peak Council record for popcorn sales at $51,029 from 2010 to 2016! Sales begin Saturday, September 8. 6:00pm in the Erie Middle School Cafeteria. Pack 62 is self-supporting and committed to keeping the cost of Scouting reasonable for all families. Several years ago, that meant holding multiple fundraisers, which in our opinion distracted from the aims of the Scouting program. The committee decided to focus on a single fundraiser and do it so well that others were not necessary. 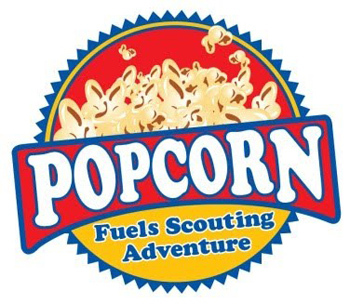 Every fall, we participate in Scouting's primary fundraiser (selling Trail's End popcorn). We encourage all Scouts to participate in this effort. Not only is it an excellent tool for teaching our Scouts about talking to people, our commission from this sale provides the funds necessary to run the Pack. Expenses covered by the Pack include purchasing awards, patches and pins, Pinewood Derby kits, Blue & Gold supplies, Scout photos, training aides for adult leaders, meeting venues, graduation gifts and countless other supplies. If sales are sufficient (and they have been) to meet those needs, additional fund-raising activities can be eliminated. Thank you to those that have participated and support Pack 62 through buying, selling or encouraging either. Pack t-shirts were handed out to every new Scout and adult leader. Raingutter Regatta - the Pack pays for the materials for the boat kits, patches and awards. Pinewood Derby - the Pack picks up the costs of facilities, patches, awards and Pinewood Derby kits. With your help, we can keep the cost of Scouting to a minimum while increasing the value our Scouts receive. We thank you for your support!